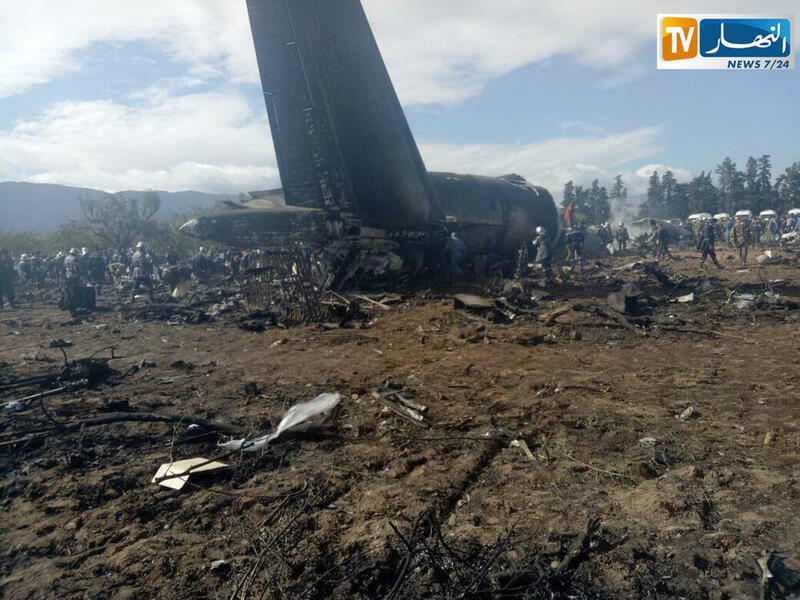 ALGIERS, Algeria -- An Algerian military plane carrying soldiers, their families and some refugees crashed soon after takeoff Wednesday into a field in northern Algeria, killing 257 people in what appeared to be the North African nation's worst-ever aviation disaster. Algeria's Defense Ministry said those killed included 247 passengers and 10 crew. An Algerian-backed group seeking independence for Western Sahara said 30 of its people, including women and children, were among the dead. The flight had just taken off from the Boufarik military base, 20 miles southwest of the capital Algiers, for the southwestern military base in Bechar, according to Farouk Achour, spokesman for Algeria's civil protection services. The flight also included a layover in the southern city of Tindouf, he said. Several witnesses told Algerian TV network Ennahar they saw flames coming out of one of the planes' engines just before it took off. One farmer said some passengers jumped out of the aircraft before the accident. "The plane started to rise before falling," an unidentified man lying on what seemed to be a hospital bed told Ennahar TV. "The plane crashed on its wing first and caught fire." "After taking off, with the plane at a height of 150 meters I saw the fire on its wing. The pilot avoided crashing on the road when he changed the flight path to the field," witness Abd El Karim told Ennahar TV, according to Reuters. Another witness said: "We saw bodies burned. It is a real disaster." The victims' bodies have been transported to the Algerian army's central hospital for identification. Algeria is vast and plane flights are often the best way to traverse Africa's largest nation. The Algeria-backed Polisario Front, which seeks independence for Western Sahara from Morocco, told The Associated Press that 30 refugees who had been treated in Algerian hospitals were among those killed in Wednesday's crash. The heavy loss of life of soldiers was certain to shake Algeria to the core. The National Liberation Army - which grew out of the fighting force which freed Algeria from French colonial rule - is revered by Algerians. The army's experience fighting terrorism has made it a valued ally of the U.S. and other western nations. The U.S. Embassy in Algiers expressed its "deepest condolences" to "our partners and colleagues in the Algerian military," and their families.